Arriving by plane: if you are arriving by plane, we can arrange a transfer from the airport to the hotel, however, a reservation is required. 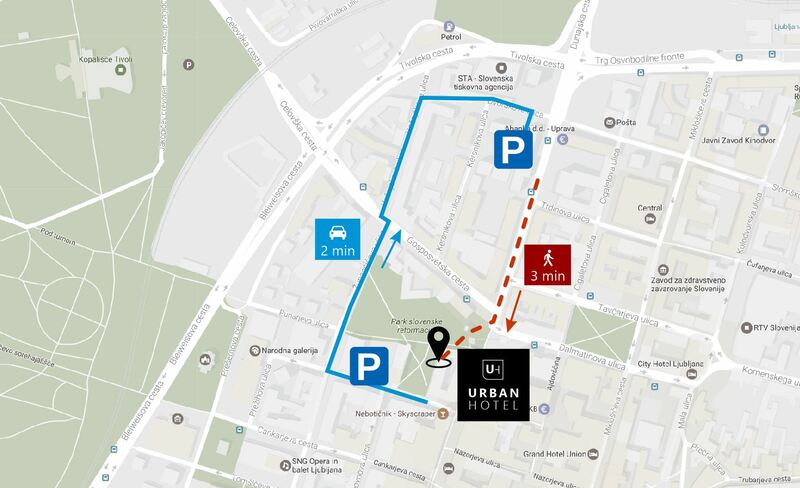 Arriving by car: Urban hotel is located in the city centre where public parking is subject to availability. The best way is to stop in front of the hotel, unpack your luggage and park just 1 minute walk back from our underground garage where we offer a parking space for 16 eur per day. Due to the limited number of our parking spaces we than advise, at full occupancy, to park in a public garage house called Kozolec, only 3 minutes walking distance from the hotel.